Clockwise from top left; Vanda sandals, Hawaianas flip-flops, The Soul of Leadership/Deepak Chopra, Q&A Diary, Whole Foods Incense Holder, Mudo and Oysho straw clutches, Oysho hat, Paper Plane Makeup Bag, Oysho bag, adidas X stella mccartney shoes, Repetto ballets, Zara lace dress, Yargıcı t-shirt. Clockwise from middle left; J Brand and Oysho lace shorts, Anthropologie Beach bag, Chanel and D&G sunglasses cases, Agent Provocateur and Insight bikinis, Lululemon sports bra, Nike reversible running shorts. Hello all! I will be a on plane tomorrow, heading to Thailand. 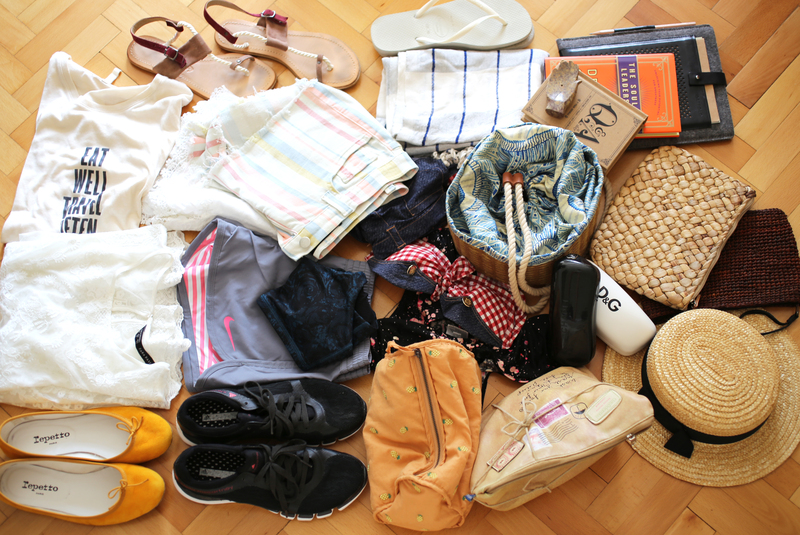 I decided to write this post as I was organizing and preparing things for my luggage, hope it is helpful for some struggling with packing. I must say, I take LOTS of toiletries, BUT they are all travel size, and what can I say, I became a master at packing after years of experience (I was travelling 4-5 times a year coming back and forth in between London and Istanbul, while I was studying there). However, this is a different experience for me, as I definitely now know what to pack to a detox retreat. Yep, no perfumes, no chemical stuff, no hair straightener, no fuss. I even considered to leave my iPad at home but couldn’t dare. Although I cheated on some things, this is definitely the lightest luggage I have ever prepared for overseas. One medium size luggage and one shoulder bag for the cabin. That is it! Let’s start with the clothes. You definitely don’t need many clothes for a week, especially for a detox week. Probably you will be walking around with bathrobes, not clothes. So try to take as little as possible. Plus, you will be shopping -that’s for sure. Your destination and weather/season is the most important things to consider when packing clothes (if you are going to Buchinger, in winter time, then definitely you need to take thermal underwear and warm clothes!) Above, you are seeing my choices for travel. Lace dress, ballets & clutch (for fancy dinners -we plan to break our detox in good restaurants in Bangkok); tshirts, shorts & sandals; sports wear & shoes; beachwear, hat, beach bag, sarong, flip-flops & sunglasses. These are more than enough for different ocassions. I also took one self care bag where I carry skincare & bathroom products (breakdown below), a cosmetics & jewelry bag (breakdown below), my iPad (like I said, I couldn’t resist), a book (although I have so many ebooks on my iPad that I haven’t read), my diary and an incense holder. I know. I know it sounds like crazy but I know some people who carry candles & pillows and even satin sheets with them so don’t judge me. I normally don’t take it with me but it really helps to transform the whole hotel room into a cozy place, and helps you to relax. All these doesn’t even cover half of the medium sized luggage, like I said, no fuss. Apart from what you see here, I also put my DSLR, chargers for iPhone & iPad and that is it. I normally pack 2-3 small bags for skincare & haircare and makeup products, and this time was no exception. Although I tried to pack as little as possible this time, as I won’t be using loads of stuff and will let my skin breathe. The key is multifunctional products. 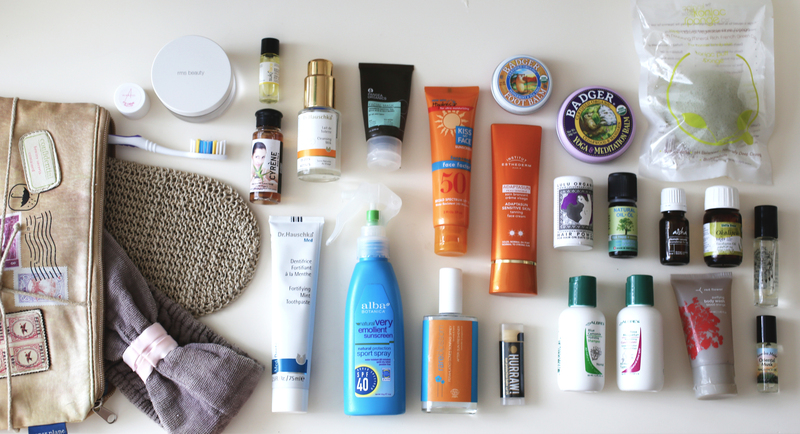 Skincare, haircare and bathroom products, all fit in one small bag. I have a skincare routine (cleanser, tonic, moisturizer), and I won’t be giving this up for travel that is for sure, so I took all these in travel/sample sizes. The multi purpose queen here is the coconut oil. I use it for hair, body, it is a great cleanser and also moisturizer. A true gem, perfect for travel. Just be sure to pack it safely cause it liquefies. I also put a travel sized face mask for emergency (my skin acts horribly during travel and adapting the weather). Careful with your toothpaste. It really matters a lot if you find a preferably organic, ecological one, simply because one of the greatest absorptions take place under your tongue. It is quite important during detox. As for suncare, I have lots of products because I finish those ones very quickly (you have to apply sunscreen every two hours!). For bathroom, I have organic shampoo & conditioner and a shower gel, all travel size. (I can’t stress enough of the importance of the travel sized products, they simply save my life!) Another thing that is highly important for me is; essential oils. They are great, I call them my medicine. Eucalyptus, tea tree & manuka, and lavender oils are my choices this time. Lavender is great for sleep, I don’t remember any day that this stuff didn’t work. I sleep like a baby. (Couple drops on your wrists or your pillow, and you’re good.) Eucalyptus is amazing when I got cold, get infected, or for a stuffed nose. It is a great antiseptic, really prevented illnesses so many times I think of it as a magical liquid. Tea tree and manuka oil is great for acne. I always get spots during travel so this is a must for me. One last thing to mention here; the perfume oils. They are natural, so they are acceptable to use during detox, directly on skin. I normally use a well-known perfume brand but not on my skin, I spray on to my clothes and hair. I read about it somewhere that spraying those chemical perfumes onto the skin is like spraying those chemical storm directly on your liver. We don’t want that, do we? Bag; Paper Plane. 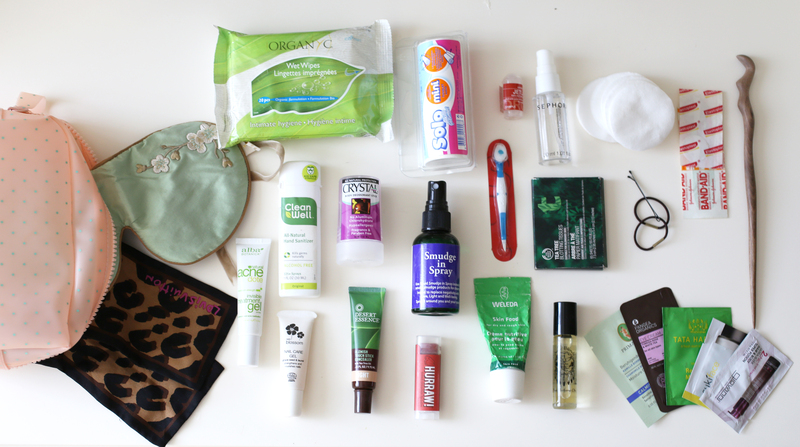 Inside the bag; Hemp scrub mitt, The Body Shop. Headband, Paul&Joe Beauty. Top left to right; Dr. Alkaitis Eye Cream (travel size), rms beauty Coconut oil, Suki Skincare Bio-Active Purifying Face Serum (travel size), Dr. Hauschka Cleansing Cream, Pangea Organics Face Mask, Kiss My Face Face Factor SPF 50 Sunscreen, Badger Foot Balm, Badger Yoga & Meditation Balm, The Konjac Sponge Co. Green Clay. Middle left to right; Cyrene Aloe Vera Tonic, Institut Esthederm Adaptasun Sensitive Skin Face Normal/Strong Sun, Lulu Organics Hair Powder in Jasmine, Vivasan Tea tree & Manuka Essential Oil, Aisha Lavender Essential Oil, Shiffa Home Eucalyptus Essential Oil, Auric Blends Love Perfume Oil. Bottom left to right; Dr. Hauschka Fortifying Mint Toothpaste, Alba Botanica Natural Very Emollient Sunscreen SPF 40, Rare Blossom After Sun Freshener, Hurraw Sun Protection Balm SPF 15, Aubrey Organics Blue Chamomile Shampoo & Rose Mosqueta Conditioner, Red Flower Purifying Body Wash, Kuumba Made Oriental Musk Perfume Oil. Because I promised myself to let my skin breathe during detox, I won’t be doing makeup like I used to (People know that I won’t get out of the house without concealer and mascara). I tried to pack organic products, which they cover 98% of the bag, but I cheated a little just in case if we have a special occasion. I am proud to say even my mascara is organic (which is not hard to find anymore but this one passed my test). Bag; Oysho. 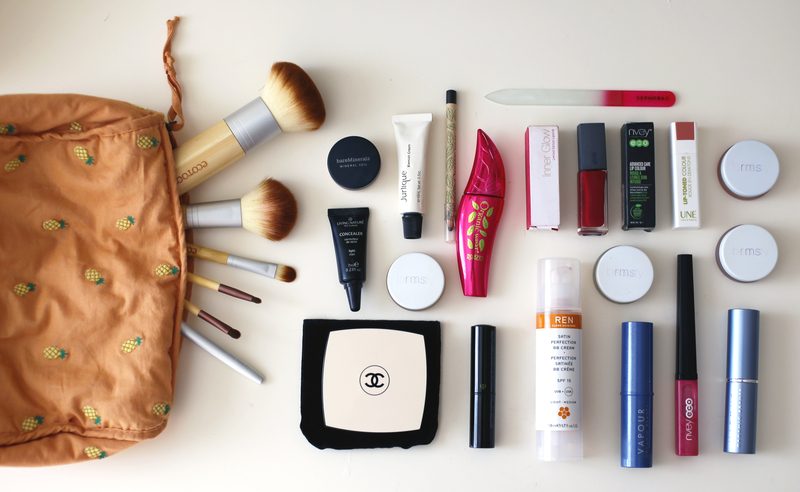 Inside the bag; EcoTools and rms beauty brushes. Top left to right; bareMinerals Mineral Veil Powder (sample size), Jurlique Blemish Cream (tinted), Physician’s Formula Organic Wear Eye Pencil in Dark Wood and Mascara in Black, Sephora Crystal Nail File, Dr. Hauschka Inner Glow Lipstick in Pink Topaz, Bite Beauty Honey Lip Lacquer in Aurora, Nvey Eco Advanced Care Lip Color in 363, UNE Lip Toned Color L02, rms beauty Lip2Cheek in Smile. Middle left to right; Living Nature Organics Concealer Light, rms beauty Un-Cover Up & Living Luminizer & Lip2Cheek in Promise. Bottom left to right; Chanel Les Beiges Healthy Glow Sheer Powder No.30, Cle de Peau Concealer in Ivory, REN Satin Perfection BB Cream, Vapour Organics Atmosphere Luminous Foundation 100, Nvey Eco Lip Lustre in Amour Rose, Vapour Organics Aura Multi Use Stain in Impulse. One thing that makes me so angry when traveling is the airport food. I never seem to find a healthy option, so I make sure at least I bring some snacks with me. I normally make my own snacks but I didn’t have time, so I took couple things that make me feel full. I also took some supplements with me. They will probably provide us some supplements there but just in case, I bring my own Blue Green Algaes (chlorella, AFA, spirulina), multivitamin and electrolyte/mineral liquid. I swear by CellFood brand, it is really amazing. I also take enzymes with me cause I know that after detox I will be eating and definitely need enzymes to help my digestion. Plus, it is good to take them with cooked food, which is deprived of all live enzymes. (I will be writing more in depth about enzymes, a truly important subject.) Protein Powders, great to make you feel full, and it is easy & quick fix for a meal. I put necessary amount of it into a BPA-free container (BPA-free, another important subject), I will need those when I will be working out. 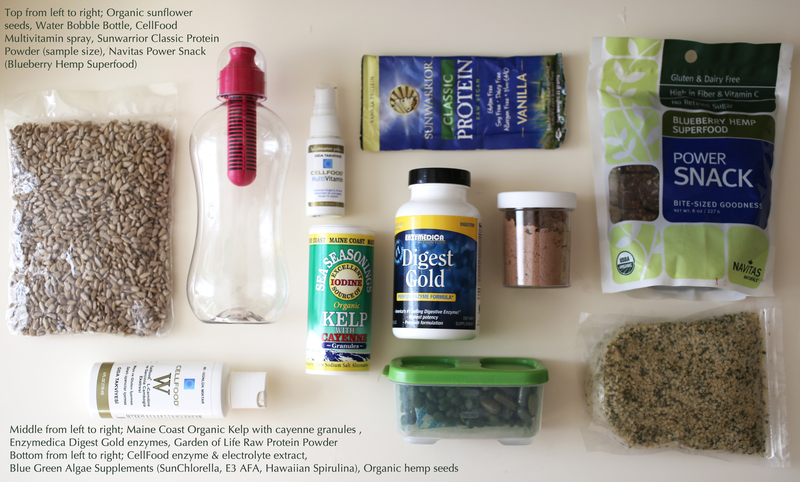 And superfoods- sunflower seeds, hemp seeds, and kelp. Those are amazing to make you feel full, and you get your daily Omega-3s and minerals. Lastly, Water Bobble Bottle is essential, it has a built in purifier (I also take the purifier out and use it as a shaker for protein powder – multipurpose!). We are coming to the end. I only take one shoulder bag with me to the cabin, that’s all. I can’t handle cabin sized baggage, it seems to slow me a lot. I prefer to be as light as possible. I also carry a very small (due to restrictions) cosmetic pouch filled with essential things for the plane. 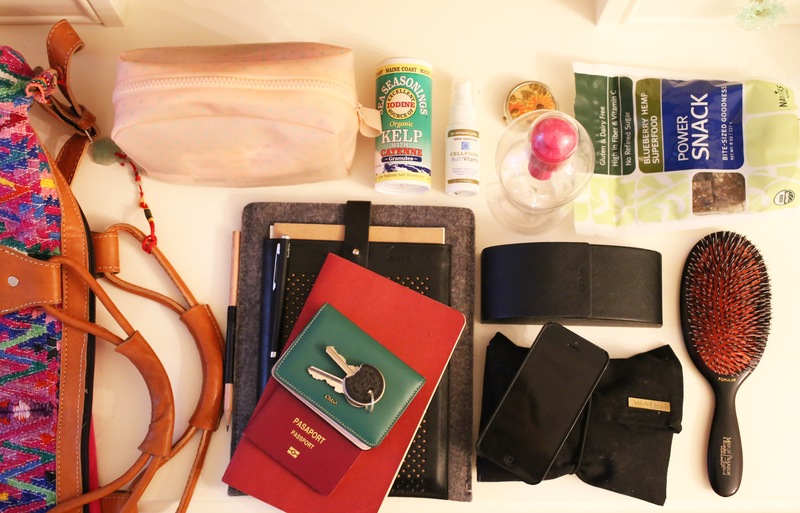 I also carry my hair brush (my hair is very long and it tangles after I sleep on it a long time), snacks & supplements, water bottle, headphones, sunglasses, iPad & notebook, passport (obviously), wallet and keys (don’t forget them!). Simple. Bag; Anthropologie. Top left to right; Women’s Secret Cosmetic Bag, Maine Coast Kelp & Cayenne Granules, CellFood Multivitamin, Vintage pill box, Water Bobble Bottle, Navitas Power Snack. Bottom left to right; Ostfold iPad Case & iPad, Moleskine Notebook, Chloé cardholder/wallet, Prada sunglasses, Molami headphones, Mason Pearson brush. And the cosmetic pouch I carry in my shoulder bag. Quite probably you are thinking ‘oh my god this girl is really crazy’. But no, I ensure you, I am not. Maybe I am a little bit perfectionist, that is all. And maybe you will thank me after. Anyway. What do I have in there? Sleep mask. That is number one. You cannot have a good sleep without it. I know they give you those on the plane but I want to encourage you to invest in a better mask- because you deserve better. This is the best mask I could find, although they are quite expensive, they really worth every single penny. It is filled with lavender (remember what I said about lavender? Hello, baby sleep.) and the inside part is made with velvet. I also have wipes, mini toilet paper (yes, believe me this is coming from experience), a very mini size essential oil blend for jetlag, band aid, hair ties & stick, blotting papers, hand sanitizer, mini toothpick & brush, some skincare products. I carry a mini bottle of makeup cleanser & cotton to take my makeup off on the plane (I know you are thinking ‘why are you doing makeup anyway?’ but for me, no-makeup is an option for beach only), and an all purpose moisturizer. I use on my face and hands. Blemish gel is also necessary (I am sure you understand that I struggle with an oily face) as well as lip balm as the air in cabin area is awfully drying. Be sure you moisturize your skin well. Don’t forget that your deodorant should be natural too (at least aluminum free). Actually it is better not to use anything, but I know for some people it is not option. Crystal deodorants are my favorite, it has no odor, really keeps you fresh all day. Bag; Women’s Secret. Inside the bag; Holistic Silk Lavender eye mask, Louis Vuitton headband. Top left to right; Organyc Wet Wipes, Solo mini toilet paper, Aromatherapy Personals Jetlag Relief, Bioderma Crealine in Sephora Spray Bottle, organic cotton, Band Aid, hair stick designed and made by my uncle. Middle left to right; Clean Well All-Natural Hand Sanitizer, Crystal Body Deodorant Stick (travel size), The Crystal Garden Smudge-In Spray, mini toothpick & stick, The Body Shop Tea Tree Blotting Paper, hair ties. Bottom left to rigth; Alba Botanica Natural Acne dote Treatment Gel, Rare Blossom Nail Care Gel, Dessert Essence Blemish Touch Stick Concealer in Light, Hurraw Tinted Cinnamon Lip Balm, Weleda Skin Food, Auric Blends Sandalwood Perfume Oil, Samples;Primavera Calming Moisturizer, Pangea Organics Eye Cream, Tata Harper Rebuilding Moisturizer, Giovanni 2chic Hair Potion, Suki Balancing Day Lotion. Bag; Paul & Joe. 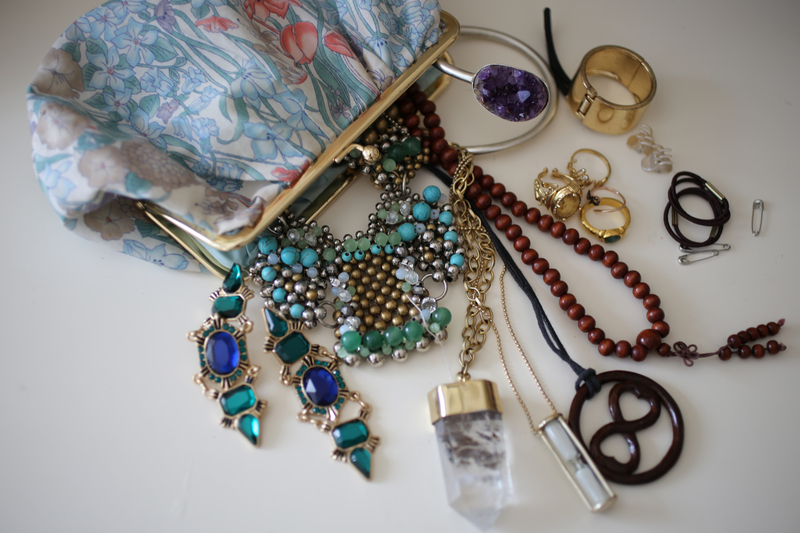 From bottom left to upwards; Zara earrings; Anthropologie , der liebling, Marc by Marc Jacobs, Whole Foods necklaces; vintage rings; der liebling amethyst bracelet; H&M hair ties. It’s been a long post! I won’t be here for couple days, but will be back with loads of photos to share with you. Hope that was helpful for some. Of course everyone is different. Take this as my experience/point of view on packing, everyone has different essentials. Manuka honey on clean skin. Followed up by sweet almond oil (sparingly!) It’s the most amazing skin treatment ever. I simply want to say I’m very new to blogging and truly liked your web-site. Very likely I’m want to bookmark your site . You actually come with fantastic articles. Thank you for sharing. well written post. I’ll make sure to bookmark it and return to read more of your useful info. Thanks for it. I’ll certainly comeback. Thank you for your kind words.. Means a lot! I want to give you a quick thanks for this exceptional info!